How To Trap Birds - One of the most important things that you can do if you start to notice birds congregating or causing damage in a particular location is to deal with it early, rather than allowing the problem to escalate, and trapping birds is one way to nip this issue in the bud. Because birds tend to congregate and cause issues around the roof line, it is often possible to ignore the problem, and to hope that it will go away, but this is very unlikely unless you take action. There are a variety of different trapping options available, with some lethal solutions and some that allow you to remove the birds to another area, but choosing the right option will depend on your particular situation. There are several different types of cage traps that can be used to catch birds, and these can be broadly divided between the Larsen cage trap which usually has more than one compartment, and is quite mobile. The larger crow or ladder traps are designed to catch multiple birds, and are usually left in one position rather than being designed to be moved regularly. The Larsen trap will usually have another bird or some kind of bait in one compartment, which will then draw the other bird towards and in to the trap. The Ladder trap is also very clever, as it will have a series of open squares that allow birds to drop in towards the bait, but only with their wings closed, so when it comes to flying out, their wings are open and they will no longer be able to escape. Traps made with netting are usually designed to catch the bird alive, and will usually entangle the bird in the net once it has been caught, meaning it cannot easily spread its wings and get away. If you are trying to catch a flock of birds, then one approach is to use cannon nets, which fire out a large weighted net to cover a specific area when the trap is triggered, and depending on the size of the net this can catch many birds in one attempt. Another net trap is known as a mist net, which is usually stretched between two trees or poles to catch any birds that fly into it, and once the birds hit the net, they fall to the pocket at the bottom of the net which keeps them entangled until you return to deal with the bird. These traps can either be designed to catch or kill the bird, and they are essentially a simple trap where a spring loaded frame with a net is set up, and when the bird moves beneath the net, the trap closes quickly around them. These are best used for birds that like to land in a spot that is quite easy to access, as you will usually need to check on trap on a regular basis. There are many different types of lethal traps that can be used to deal with a bird problem, although it is very important that you check with your local wildlife department to ensure that the measures you plan to use are legal. A deadfall trap is a simple way of killing birds, but are best used if the problem birds are on the ground, and generally involves a flat heavy stone that is propped up, which then falls on the bird when the trap is triggered. Other lethal methods can include a cage trap which includes poison bait, or simply waiting for a cage trap to catch several birds and then to dispose of them humanely. The bait that can be used for these traps is generally straightforward, and bird seed is usually more than enough to draw the birds into the trap. If you are trying to catch a bird like a magpie, which responds to the call of another bird, baiting the trap with another bird can also be successful. If you do wish to use poison bait with your traps, it is very important that you locate the trap correctly, as these avicides are indiscriminate and will kill all types of animals, so you need to ensure you are targeting the particular birds causing the problem. If you find that trapping birds isn't working efficiently and solving the problem for you, then there are some other measures that you can try to use, including installing bird spikes and anti bird netting. Bird spikes can be installed on any roof ridge or window sill where the birds are landing and causing a nuisance, and they can be a very easy way of driving birds away. Anti bird netting is designed to cover larger areas, and in domestic properties is mounted several inches above the surface of the roof, preventing birds from landing there. 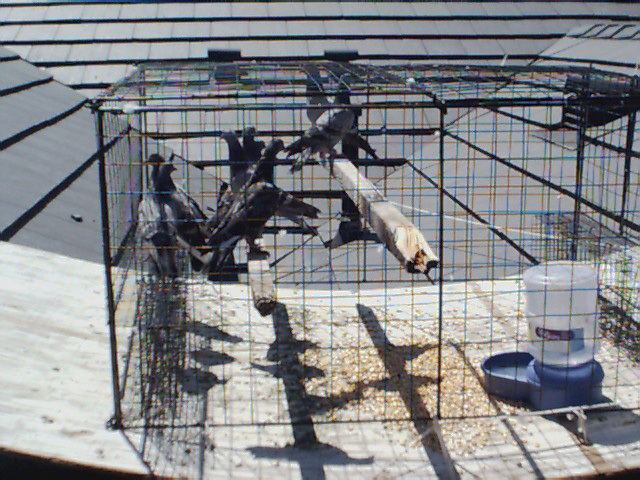 Go back to the main Pigeon and Bird Removal page for more information about bird trapping and information about how to catch a bird in a cage trap.